Kassidy in the batting cages at PGF headquarters where she got to get tips from legends like Crystl Bustos and Amanda Freed. Having the summer off if you’re a dedicated softball player is hardly a “vacation,” unless you count going to some cool locales like Huntington Beach, Boulder or Atlanta as a vacation while you’re playing a showcase or in a nationals. For Kassidy Krupit, our long-time blogger who has written and or done videos for Extra Inning Softball on topics ranging from “What Softball Has Taught Me” to “Pitch Recognition,” she had one eventful summer on and off the field. 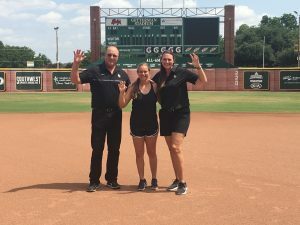 Kassidy with Baylor coaches Glenn Moore and Britni Sneed Newman. It started in June when she got to commit to Baylor after getting a lease from Delaware after the Blue Hens had a coaching change. Then she hit the trifecta of winning a National Championship, being an All-American and being selected as one of the top hitters in the country as part of the Louisville Slugger Hit Club! Here’s a look at all three events from Kassidy’s prospective and what’s coming up for the outstanding hitter who will soon be going from the Orange & Blue colors of the East Cobb Bullets to the Green & Gold of the Baylor Bears!